The RSPB AGM was an uplifting end to a tough week. Tragically, two brilliant colleagues – John Lanchbery and Roy Taylor - passed away this week. In very different ways, they personified the best of the RSPB. John dedicated his career to securing global action to tackle climate change particularly through reducing greenhouse gas emissions from the loss of tropical forests which was a core part of the landmark Paris Agreement. Roy focused on shaping policy to drive practical conservation (for example through SCAMP) and there are large swathes of northern England that have been transformed thanks to his vision, dedication and boundless enthusiasm. These two heroes of conservation died in the week after the publication of the IPCC report –the latest wake up call and reminder that the scale of the political response is miles away from what needs to happen to avoid global temperature rise of 1.5 degrees Centigrade above greenhouse gas emissions. Our job is to ensure that their legacy continues both by nurturing what they achieved but also by using the knowledge and inspiration that they passed on to us. That means we shall support calls for the UK Government to set a new target of net zero greenhouse gas emissions by 2050. We shall continue to argue for a revolution in the way we use and generate energy in harmony with nature. We shall make the case for greater investment in protecting natural habitats at home and internationally (such as forests and peatlands) to protect both the climate and biodiversity. And, we shall explore how best to reduce the carbon footprint of what we eat including, as I promised in response to a question from the AGM floor today, whether to promote meat-free Mondays (or more) through our own catering operation. I was sorry that John and Roy were not at our AGM yesterday to see another hero, Caroline Lucas MP, receive the RSPB Medal for her immense contribution to environmental causes and to hear her impassioned speech calling for greater action to save nature. I was sorry that they were not there to see such dedicated volunteers receive their President’s award for the work they contribute to our charity. I was sorry that they did not hear a member of our Phoenix Forum, Will Walsh, remind our membership of the passion and drive of teenagers giving confidence that the next generation are up for the challenge of dealing with whatever mess we pass on to them. 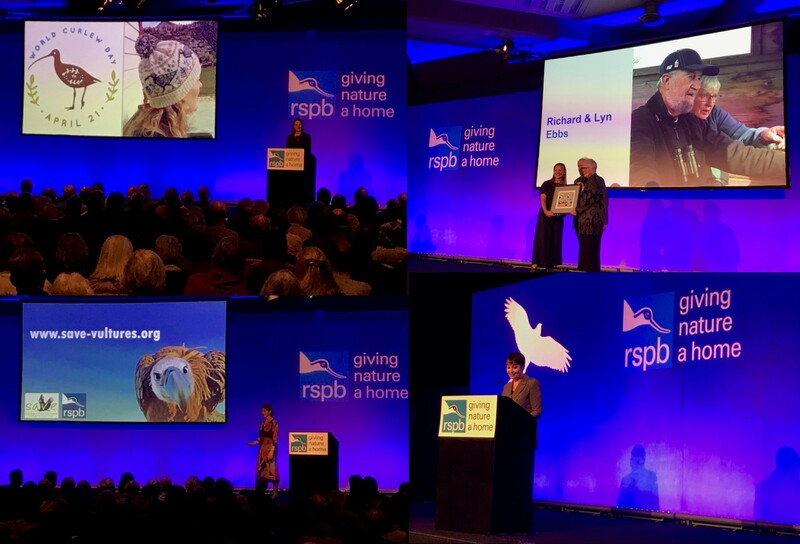 And, I was sorry that they did not hear fantastic talks from my colleagues about our work to save threatened species such as curlew, seabirds and Asian vultures, restoring special places like Franchises Lodge in the New Forest and inspiring more people to support our work. But, the AGM was uplifting. It offered cause for realistic optimism that we have people prepared to dedicate their lives – like John and Roy - to tackling the twin crises of climate change and loss of biodiversity. After the AGM, I headed north with the family for half term. My first stop is to part of Roy Taylor's England - RSPB St Aidan’s where I am running a half-marathon connecting another of our nature reserves Fairburn Ings. What I heard was what could happen to the RSPB, if these cuts where not made and it was quite a shock to hear this if true. Be interested to know what you have heard Thomo! The RSPB is a great organization but it would good if at times things were a bit more transparent. I totally agree though with the RSPB hen harrier stance though. I’ve learnt a lot more from a friend about the RSPB’s financial problems and what I heard was really shocking, of which I wouldn’t dare post on here. So you probably heard the clear and unambiguous request from our President on how to present questions at the AGM. What therefore is the relevance of your earlier Comment at 8:56 AM on 21 Oct 2018? According to the report ‘Feasibility of translocating hen harriers to southern England, and prioritisation of potential translocation sites and strategies’ by Hodgson et al, Defra and NE - the appropriate UK bodies - were obviously satisfied with the conclusion reached by Professor Hodgson and the other listed & distinguished co-authors, that the threat(s) that caused the previous extinction of the hen harrier in southern England in the early 19th century had been correctly identified and could be sufficiently mitigated as per IUCN guidelines. And our Charity thought so too when it endorsed and welcomed the plan in January 2016. Perhaps your county recorder would like to share his concerns here? I was at the AGM and was a little disappointed that we were not told more about the staff cuts. Surely this will impact on the work of the society as there will be less people to carry out conservation. Great decision to award Caroline Lucas the medal though. She is fantastic.